Gloves off: Tai Tuivasa and Israel Folau. 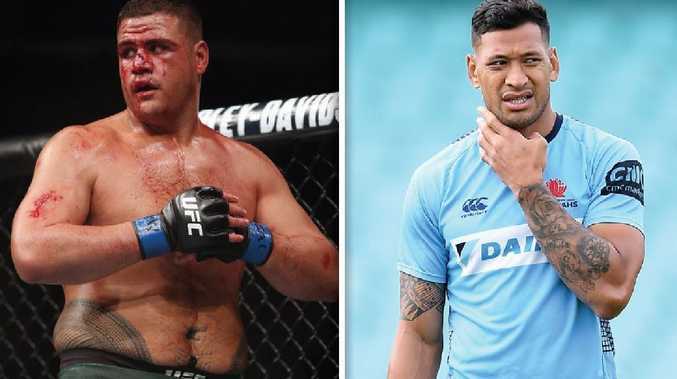 AUSTRALIAN UFC star Tai Tuivasa has lashed Israel Folau as a hypocrite, claiming he's seen the Wallaby superstar "blind as a skunk" and carrying on like a "f---ing idiot" on a night out. Joining the chorus of backlash against Folau's anti-gay remarks, Tuivasa told the Daily Telegraph that Folau needed "a hiding". "I know what I've seen that idiot do when he's out and about ... I've seen you out blind as a skunk carrying on now you wanna be all churchy?" UFC heavyweight Tuivasa said. "I won't go into detail about what went on, but I know what happened. And I know what I saw. "The guy carried on like a f---ing idiot. "Yet now he wants to be all righteous and put on a show?" It's not clear when the alleged encounter occurred and Folau spoke in 2016 of changing his partying ways after getting "caught up in the alcohol, women and all that sort of stuff" during his NRL days. But Tuivasa said even if Folau had changed now "that's no reason to go around trying to bring other people down". "Has he even thought there might be young footballers out there following him on social media - kids who are 11, 12 - and they're gay? What happens to them when they read that at home?," Tuivasa said. "Suddenly this guy they look up to is saying they're going to hell. He needs to pull up."